Wow! Elvis in da house too! Size matters-- as long as ya got the hands for it! And I ain't messin' with no mofo with them kinda hands. I feel extra sorry for his woman too. 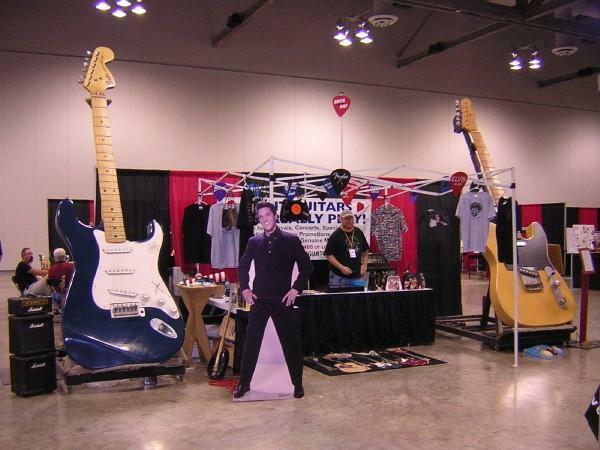 Built by Michael McBride in Charlotte, NC, these guitars are licensed by Fender, also making them the world's largest playable Fender guitars. The Strat you see above was built in 1998 and has toured the world for various events, fund raisers, etc. It's been featured on television shows including Ripley's Believe it or Not. I don't know where he got the strings, but they probably will never need changing. McBride is still building these things to order, and mentions a Les Paul project, which will be the world's largest federal raid target I guess... These guitars are 4X scale-13' tall. I guess you tune it with a big wrench, and adjust the truss rod with a crowbar. giantguitars - (McBride's eBay username) is currently listing Stratzilla for a paltry sum. Paul Allen should buy it for the EMP Museum!